Windows 8 systems have built-in Windows Defender to help you protect the computer from malware and other kind of threats. This tool was made to detect and remove Trojans, viruses, spyware, adware, and other types of malicious programs. Once you start the PC, Windows Defender runs in the background and start to protect your computer. When a threat is detected, it will notify you and request to take specific action for identified security risks. Same with other anti-virus software, you can use Windows Defender to scan PC for malware if something suspicious is noticed. How to use Windows Defender? 1. Tap or click the Search Charm, search for defender, and then double-click the program to open. 2. On Home tab of Windows Defender, click preferred scan option and click Scan Now to start checking the computer for presence of malware. 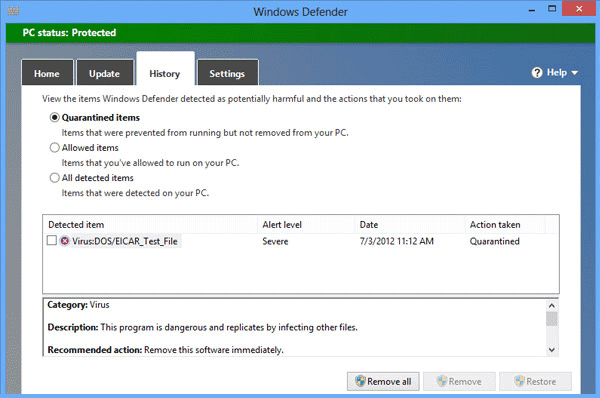 Windows Defender is included in Windows 8 system as replacement for Microsoft Security Essentials. You cannot use this program on lower versions of Windows. For Windows XP (SP3), Windows Vista (SP1 and SP2), and Windows 7, you can use Microsoft Security Essentials to clean viruses from the computer. Windows Defender seems unable to remove the Trojan:Win32/Dynamer!ac. I ran the full scan it showed the Trojan, when I use the removal tool, it freezes at about the 70% mark and though it shows it is still scanning it won’t go past that threshold. it has been running for over an hour and there is no progress on the removal tool. Any ideas? Michael, how about booting Windows in SafeMode, then run the scan from there?